for 180 days of access. 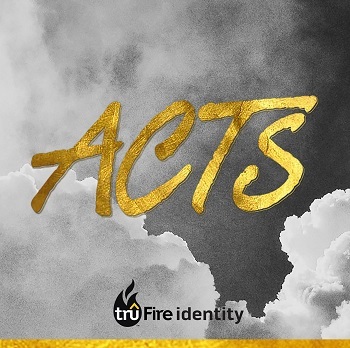 Tru Fire Identity empowers middle school students to own their faith as they seek and respond to God, finding their identity in Him. This study of the book of Acts will nurture in students an understanding of the continuity of God’s redemptive story and help them find their place in it. By God’s power and the guidance of the Holy Spirit, even the most unlikely and “unqualified” of individuals can experience personal transformation and fruitfulness in life and mission—to hear the call to be part of a community of people whose deepest desire is to live the life of Jesus by the power of the Holy Spirit, all to the glory of God. At Home Weekly: Equips parents to introduce the weekly God-centered topic and spend time together in God’s Word, prayer, and providing a blessing.